Little Annabel Bean started having stomach troubles when she was just four. Her parents' quest for a diagnosis finally led to "pseudo obstruction motility disorder," an incurable condition where the stomach muscles don't work properly. One afternoon when she was nine, weary of the house and bed, she—a tomboy like her older sister whenever she had the energy—joined her sister on the high branch of an old tree. The branch started to creak and then move and the girls scrambled for the safest way down. In that scramble, Anna fell headfirst into a grotto-like hole in the tree's trunk near where they had been sitting. It turned out the hole wasn't the entrance to a shallow wooden cave but the mouth of the trunk that was hollow to the ground. Anna fell 30 feet that day. She should have been killed. Another story that got everyone talking was the birth of John the Baptist. His birth to elderly parents, his father Zacharias's inability to speak throughout Elizabeth's entire pregnancy, then his parents' choice of name for him—John instead of Zacharias II, defying all convention—provoked "fear" (phobos - dread, fear, reverence) in all who lived nearby. Though we may never have experienced God working in our lives in such dramatic ways as did John the Baptist's parents or Anna Bean, He is at work in our lives too. Let's stay alert to His activity. When we do sense His presence in things like little "coincidences" to the miracles we may experience, hear, or read about, let's not rationalize away His working: Anna was just lucky to fall the right way. Her vision was the product of an overactive imagination. The fact she never needed another pain pill after this was just coincidence…. 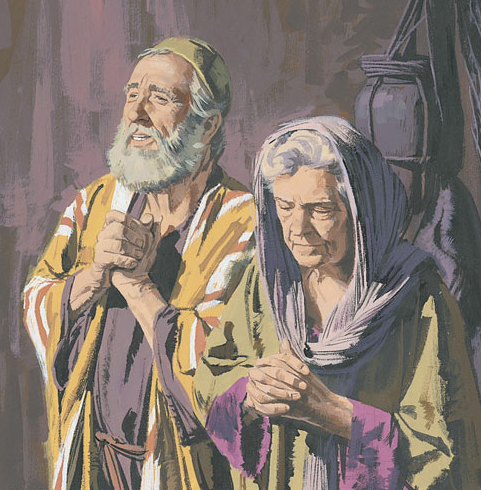 Rather, let's view God activity in our lives and the lives of those around us with the fear, dread, and reverence of Zacharias and Elizabeth's Judean neighbours. Let's let such examples strengthen our faith and reassure us that God is alive and active in our world. PRAYER: Dear God, thank You that in my time, though filled with technological savvy where the tendency is to look for a natural explanation for everything, there are evidences that You still break through in miracles. Help me to believe, "The Lord's hand is not shortened that it cannot save; neither His ear heavy that it cannot hear" (Isaiah 59:1). Amen. Almighty God, by whose providence your servant John the Baptist was wonderfully born, and sent to prepare the way of your Son our Savior by preaching repentance: Make us so to follow his teaching and holy life, that we may truly repent according to his preaching; and, following his example, constantly speak the truth, boldly rebuke vice, and patiently suffer for the truth's sake; through Jesus Christ your Son our Lord, who lives and reigns with you and the Holy Spirit, one God, for ever and ever. Amen. * Annabel's mother has told her story in the book Miracles from Heaven. A movie based on the story (Miracles From Heaven) was released in March, 2016.